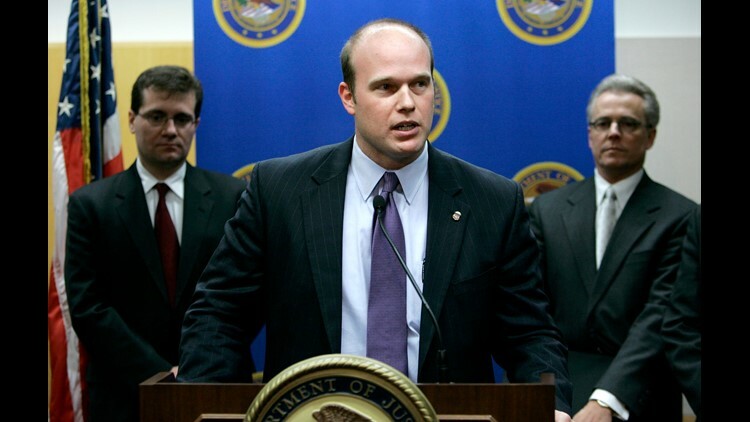 U.S. Attorney Matthew Whitaker speaks during a news conference as James Vandenberg, Office of Inspector General for the Dept. of Labor, left, and Iowa state Auditor David Vaudt, right, look on Jan. 16, 2007, in Des Moines, Iowa. President Donald Trump named Whitaker acting attorney general Wednesday, after Jeff Sessions resigned. WASHINGTON – If President Donald Trump was seeking an attorney general free of potential conflicts with the investigation of Russian interference in the U.S. election, Matthew Whitaker would be an unlikely candidate. Known as a Trump loyalist during his yearlong tenure as chief of staff to Attorney General Jeff Sessions, Whitaker was promoted Wednesday by President Donald Trump to take his boss's job after Sessions was forced out. He immediately came under scrutiny. The former federal prosecutor from Iowa has been a vocal surrogate for the Trump administration. At various times, he publicly called on Deputy Attorney General Rod Rosenstein to rein in Robert Mueller, the Justice Department special counsel leading the Russia investigation. He has referred to any examination of the Trump family finances as breaching a “red line” of Mueller's authority. In a television appearance in July 2017, he raised the prospect that the Justice Department, rather than firing Mueller outright, could choke off funding for the office, which would lead to the inquiry’s slow death. Sessions, a former adviser to Trump's presidential campaign, recused himself from oversight of Mueller's investigation to avoid potential conflicts of interest, a move that infuriated Trump and set the stage for the attorney general's eventual departure. Despite his criticism of the special counsel, there was no immediate indication that Whitaker intended to recuse himself from overseeing Mueller's work, a task that until Wednesday was carried out by Rosenstein. Democratic lawmakers and some Republicans signaled deep unease with the new leadership at Trump's Justice Department and the threat it could pose to Mueller's inquiry. Ranking Democrats on congressional committees that oversee Justice operations demanded that administration officials, including Whitaker, preserve all records relating to the Mueller investigation and the firing of Sessions. "We remind you that concealing, removing or destroying such records may constitute a crime, may result in the immediate disqualification from holding a position in the federal government and may be punishable by up to three years' imprisonment under federal law," lawmakers warned in a statement. Similar warnings, issued by Sen. Dianne Feinstein, D-Calif., and Reps. Elijah Cummings, D-Md. ; Jerrold Nadler, D-N.Y.; and Adam Schiff, D-Calif., were directed to FBI Director Christopher Wray, CIA Director Gina Haspel and other national security officials. Sen. Susan Collins, R-Maine, whose name was not attached to the document preservation demand, issued a separate statement urging that Mueller's work be protected in the wake of the Justice Department shakeup. "Special counsel Mueller must be allowed to complete his work without interference – regardless who is AG," Collins said. Collins' remarks were followed by similar comments from Mitt Romney, the Republican senator-elect from Utah, and Sen. Jeff Flake, R-Ariz.
Whitaker, a former University of Iowa football player, has made no secret of his qualms about the special counsel's inquiry and other politically charged matters that confronted the department. "It is time for Rosenstein ... to order Mueller to limit the scope of his investigation to the four corners of the order appointing him special counsel," Whitaker wrote in a 2017 column for CNN. "If he doesn't, then Mueller's investigation will eventually start to look like a political fishing expedition. This would not only be out of character for a respected figure like Mueller, but also could be damaging to the president of the United States and his family – and by extension, to the country." Around the same time, Trump told The New York Times in an interview that Mueller would be venturing beyond his authority by examining issues related to the president's family finances. On CNN last year, a few months before joining the Justice Department, Whitaker raised the prospect of cutting funding to Mueller's team, allowing the investigation to "grind to a halt." Whitaker's links to Mueller's investigation go beyond public statements. He served as an adviser to Sam Clovis, a former Trump campaign official who was interviewed by Mueller's team, during Clovis' 2014 campaign for Iowa state treasurer. Like Trump, Whitaker took issue with the decision in 2016 not to prosecute Hillary Clinton for her handling of classified information while she was secretary of state. In an opinion piece for USA TODAY, Whitaker disagreed with then-FBI Director James Comey that "no reasonable prosecutor" would indict Clinton in connection with her use of a private e-mail server. "I believe myself to have been a reasonable prosecutor, and when the facts and evidence show a criminal violation has been committed, the individuals involved should not dictate whether the case is prosecuted," Whitaker wrote. He wrote the column while serving as executive director of the Foundation for Accountability and Civic Trust, a conservative watchdog group. Some critics said Whitaker's very elevation – from a senior staffer to the nation's chief law enforcement officer – subverts the Constitution. Neal Katyal, who was acting solicitor general in the Obama administration, and attorney George Conway, spouse of White House adviser Kellyanne Conway, slammed the appointment Thursday in a column published in The New York Times. The pair argued that Whitaker's appointment bypassed the Senate confirmation process required of Cabinet officials. "Because Mr. Whitaker has not undergone the process of Senate confirmation, there has been no mechanism for scrutinizing whether he has the character and the ability to evenhandedly enforce the law in a position of such grave responsibility," Katyal and Conway wrote. "The public is entitled to that assurance, especially since Mr. Whitaker's only supervisor is Mr. Trump himself, and the president is hopelessly compromised by the Mueller investigation."